In my ‘All the Manufactured News That’s Fit to Believe™’, wd, Oct. 3, 2018; Café version, C99% version, I’d mentioned that the Intercept had done at least four four smears of Julian Assange, glorified the White Helmets psyop, and had featured this Tweet by Sharmine Narwani: “When @TheIntercept sounds exactly like the NY Times: Resident Syrian-nun-basher Jeremy Scahill interviews “leftist” Noam Chomsky who calls #Syria‘s jihadi-busting govt a “murderous regime” & thinks US troops should remain illegally in the sovereign state” with this link to the Intercept. I hadn’t checked the dates as to whether or not some were after WikiLeaks had published the CIA Vaults 7 and 8, come to think of it. But certainly after those publications was when WikiLeaks was thrown off the anonymyzing donations funneled through the Freedom of the Press Foundation that Julian, Michael Ratner, and a couple others had started. (I’d asked) How often have we seen reports from the UK that use Bellingcat as their only source? the BBC, for certain (zounds, quite a list on just the first page of hits), the Daily Mail, the New Yorker, according to Bellingcrap’s Aric Toler: “(The New Yorker profiled one of our trainings in London. The Tbilisi workshop is a three-day training ran in Russian, free to all participants)” (I’d updated the list with the Guardian in comments. And laughing at the WaPo spawned PropOrNot list, provided the updated Prop list, and had jested: Whew; close call: the Intercept ain’t on it! Now we know why. But oopsie, I hadn’t noticed earlier the Related Projects on the right sidebar, including Bellingcat and Digital Forensics Research Lab. Given that Mintpress News content is all Creative Commons, I’m going to paste in the Webb’s entire piece, especially as it’s loaded with hyperlinks. “NEW YORK — The Intercept, along with its parent company First Look Media, recently hosted a workshop for pro-war, Google-funded organization Bellingcat in New York. The workshop, which cost $2,500 per person to attend and lasted five days, aimed to instruct participants in how to perform investigations using “open source” tools — with Bellingcat’s past, controversial investigations for use as case studies. The exact details of what occurred during the workshop have not been made public and Bellingcat founder Eliot Higgins declined to elaborate on the workshop when pressed on social media. The decision on the part of The Intercept is particularly troubling given that the publication has long been associated with the track records of its founding members, such as Jeremy Scahill and Glenn Greenwald, who have long been promoted as important “progressive” and “anti-war” voices in the U.S. media landscape. Greenwald publicly distanced himself from the decision to host the workshop, stating on Twitter that he was not involved in making that decision and that — if he had been — it was not one “that I would have made.” However, he stopped short of condemning the decision. Bellingcat’s open support for foreign military intervention and tendency to promote NATO/U.S. war propaganda are unsurprising when one considers how the group is funded and the groups with which it regularly collaborates. For instance, Bellingcat regularly works with the Organized Crime and Corruption Reporting Project (OCCRP), which – according to the late journalist Robert Parry – “engages in ‘investigative journalism’ that usually goes after governments that have fallen into disfavor with the United States and then are singled out for accusations of corruption.” OCCRP is notably funded by USAID and the controversial George Soros-funded Open Society Foundations. In addition, Bellingcat’s founder Eliot Higgins is employed by the Atlantic Council, which is partially funded by the U.S. State Department, NATO and U.S. weapons manufacturers. It should come as little surprise then that the results of Bellingcat’s “findings” often fit neatly with narratives promoted by NATO and the U.S. government despite their poor track record in terms of accuracy. Bellingcat’s funding is even more telling than its professional associations. Indeed, despite promoting itself as an “independent” and open-source investigation site, Bellingcat has received a significant portion of its funding from Google, which is also one of the most powerful U.S. military contractors and whose rise to prominence was directly aided by the CIA. Google has also been actively promoting regime change in countries like Syria, a policy that Bellingcat also promotes. As one example, leaked emails between Jared Cohen, former director of Google Ideas (now Jigsaw), and former Secretary of State Hillary Clinton revealed that Google developed software aimed at assisting al-Qaeda and other Syrian opposition groups in boosting their ranks. Furthermore, Cohen was once described by Stratfor intelligence analysts as a “loose cannon” for his deep involvement in Middle Eastern regime-change efforts. Under President Donald Trump, Google’s connections to the U.S. government have become even more powerful, as the current Trump-appointed Director of National Intelligence once worked as a corporate lobbyist for Google. Given the clear alliances between Bellingcat and the military-industrial complex, The Intercept’s decision to host a Bellingcat workshop in its New York offices may seem surprising. However, The Intercept has long promoted Bellingcat in its written work and its parent company has actually been associated with Bellingcat since 2015. Indeed, Google-owned YouTube announced in 2015 the formation of the “First Draft coalition,” which nominally sought to bring “together a group of thought leaders and pioneers in social media journalism to create educational resources on how to verify eyewitness media.” That coalition united Bellingcat with the now-defunct Reported.ly – another venture of The Intercept’s parent company, First Look Media. In the years since, The Intercept has repeatedly promoted Bellingcat in its articles, having called the Atlantic Council-connected, Google-funded group “a reputable U.K.-based organization devoted to analyzing images coming out of conflict zones.” Furthermore, prior to the recent workshop in late September between The Intercept and Bellingcat, both jointly participated in another workshop hosted in London earlier this year in April. In addition, the Intercept’s main funder – eBay billionaire Pierre Omidyar – shares innumerable connections to the U.S. government and has helped fund regime-change operations abroad in the past, suggesting a likely reason behind the publication’s willingness to associate itself with Bellingcat. For instance, Omidyar made more visits to the Obama White House between 2009 and 2013 than Google’s Eric Schmidt, Facebook’s Mark Zuckerberg or Amazon’s Jeff Bezos. He also donated $30 million to the Clinton global initiative and directly co-invested with the State Department — funding groups, some of them overtly fascist, that worked to overthrow Ukraine’s democratically elected government in 2014. Even after Obama left office, Omidyar has continued to fund USAID, particularly its overseas program aimed at “advancing U.S. national security interests” abroad. Omidyar’s Ulupono Initiative also cosponsors one of the Pentagon’s most important contractor expos, a direct link between Omidyar initiatives and the U.S. military-industrial complex. Such promotion of the regime-change wars has been reflected in reporting done at The Intercept, particularly in regards to Syria. Indeed, Intercept writers covering Syria frequently promote Syrian “rebels” and the opposition while also promoting pro-regime-change talking points. Another former Intercept contributor and now Intercept “fact checker,” Mariam Elba, wrote a poorly researched article that sought to link the Syrian government to U.S. white nationalists, claiming that the Syrian government sought to “homogenize” the country despite its support for religious and ethnic minorities in stark contrast to the Syrian opposition. 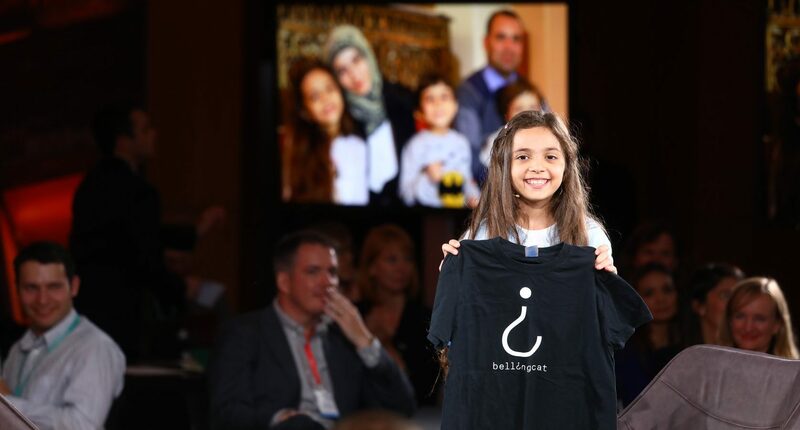 Notably, Elba recently praised the Intercept/Bellingcat workshop, which she had attended. If that weren’t enough, last year the paper hired Maryam Saleh, a journalist who has called Shia Muslims “dogs” and has taken to Twitter in the past to downplay the role of the U.S. coalition in airstrikes in Syria. Saleh also has ties to the U.S.-financed propaganda group Kafranbel Media Center, which also has close relations with the terrorist group Ahrar al-Sham. “Even “anti-interventionist” Intercept journalists like Jeremy Scahill and Glenn Greenwald have come under fire this past year for allegedly promoting inaccurate statements that supported pro-regime-change narratives in Syria, particularly in regards to an alleged chemical weapons attack in Douma. That attack is now widely believed to have been staged by the White Helmets. Author’s Note | John Helsby contributed research, particularly in regards to social media, to this report. This entry was posted in empire and war crimes, psyops and propaganda. Bookmark the permalink. Nicely researched, discovered, aggregated, and encapsulated, wde. thank you, mein herr davidly. but how serendipitous it was to discover webb’s ‘when the intercept met be bellingcat’ (first working title?) a week after featuring both juke joints. in the c99 version, a couple women in germany said that their teevee news is featuring exposés by bellingcat on the ‘skripal affair’ as The Truth. makes sense, as germany is EU and decidedly part of the imperium. and here i’d thought what i’d already known and loathed about the place couldn’t rise to a higher level. fool! but that withheld snowden saudi document, oy, how utterly sick of him/them. what else have they withheld is the larger Q. oh, those crazy archivists! webb has a more recent one up that i haven’t decided whether to bring or not, fearing i might commit yellow journalism by snagging only the most incendiary bits…on purpose. and facebook’s most recent deletions of 800 sites are all on the Prop list of PropOrNot, the wsws is reporting. in preparation for a total police state move, i reckon.